I’m back with another internet recipe. Maybe I’m not feeling especially creative in the cooking department lately, but that’s okay because this recipe is awesome and it’s a technique I think everyone should know about. If you frequent Pinterest or cooking websites as much as I do, you may have seen the One Pot method of cooking pasta. The pasta and toppings – such as tomatoes, onions, and basil – are all cooked together in one pot and the liquid evaporates by the end, making for one flavorful pasta. This method kind of blew my mind. It almost doesn’t seem like it should work, but after reading through dozens of comments on the blog, I saw how satisfied people were with the recipe and thought maybe I would try it. 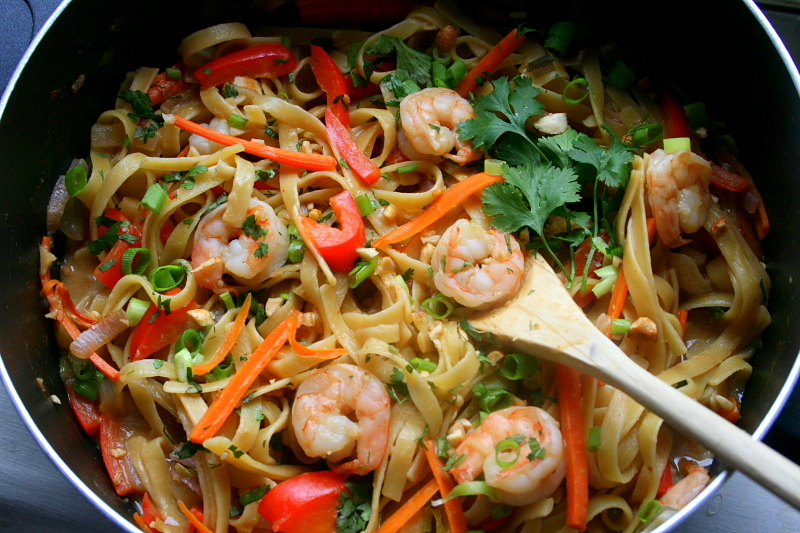 Then I stumbled upon One Pot Wonder Thai Style Peanut Pasta and knew I had to make it. 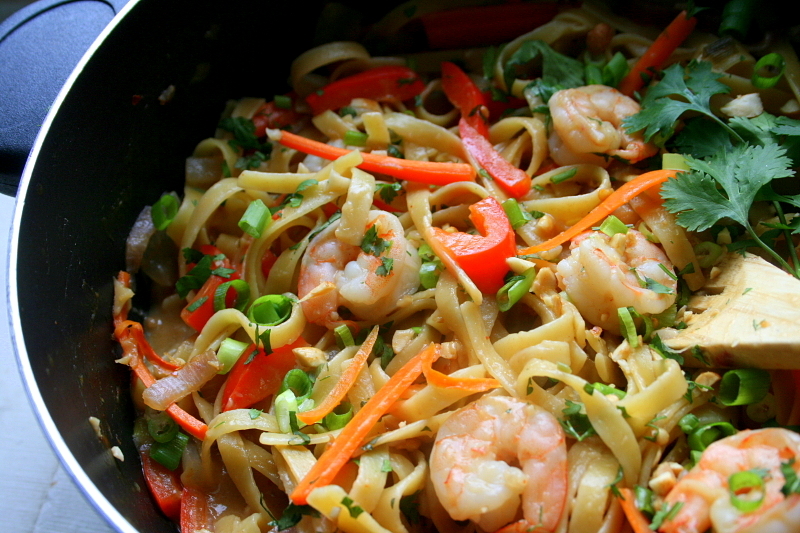 A Pad Thai-style dish, all made in one pot and under 20 minutes? Yes please! My family loves Pad Thai and usually gets four orders of it when we get Thai take-out. I’ve been toying with the idea of making my own Pad Thai for a while now, but often the ingredients can be somewhat obscure and the recipe intimidating. I was a bit skeptical that this one-pot method would work – what if there was too much liquid left at the end and the noodles were soggy? – but this recipe also had many positive comments and so off I was to cook it. I have to say, I couldn’t be more pleased with how this dish came out. It may not be 100% authentic Pad Thai, but it was sure packed with flavor and one of the best dishes I’ve had in a while. Noodles and veggies are cooked in a broth with peanut sauce and other Asian flavors, and come together to make a delicious dish reminiscent of Pad Thai. I adjusted the original recipe slightly to suit my taste, but mainly stayed true to it. 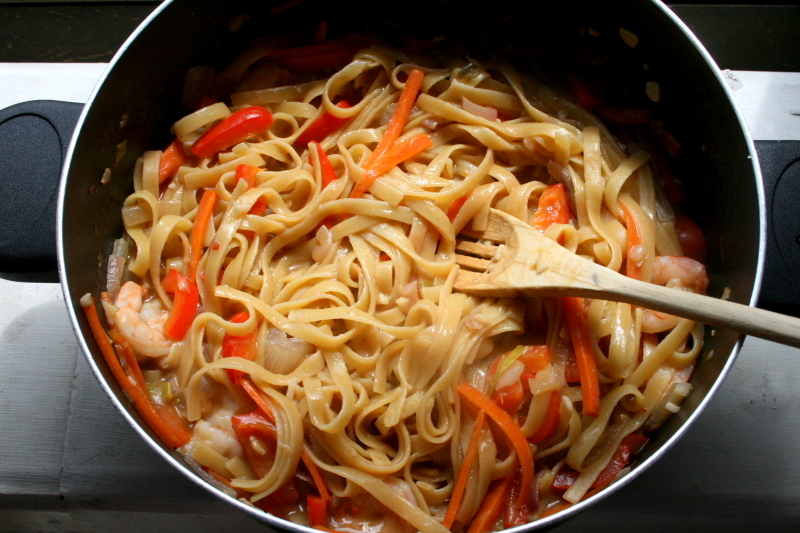 I also added some shrimp to mine, which I thought complimented the dish well, but alternatively you could add chicken, tofu, or just stick with the noodles! *Most dried pasta comes in 16 oz. packages – just use your best judgment to take 3/4 of the box. Also, white pasta is recommended for this recipe as whole grain or rice pasta has differing cooking times. 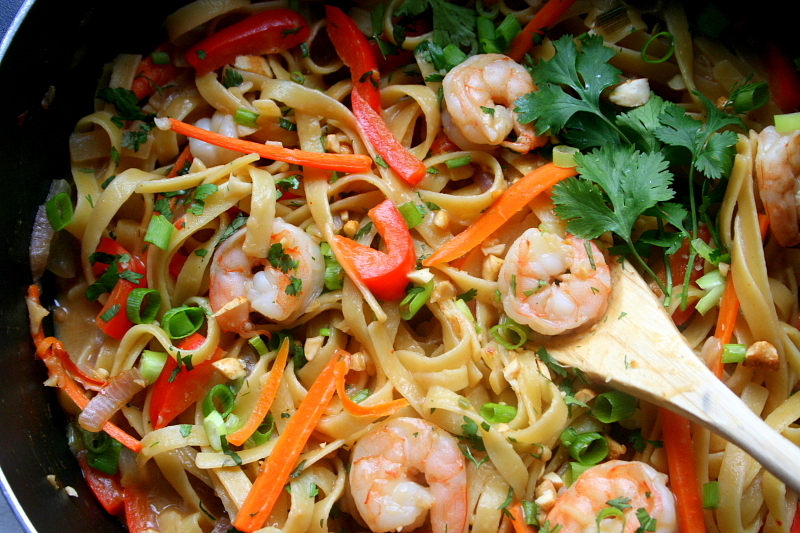 **In addition to fish sauce, authentic Pad Thai also uses tamarind paste, a sour-flavored condiment that can be found at Asian grocers, and bean sprouts. Feel free to add these things if they’re available to you! In a large (3 – 4 quart) pot, heat 1 Tbsp canola or olive oil over low heat. 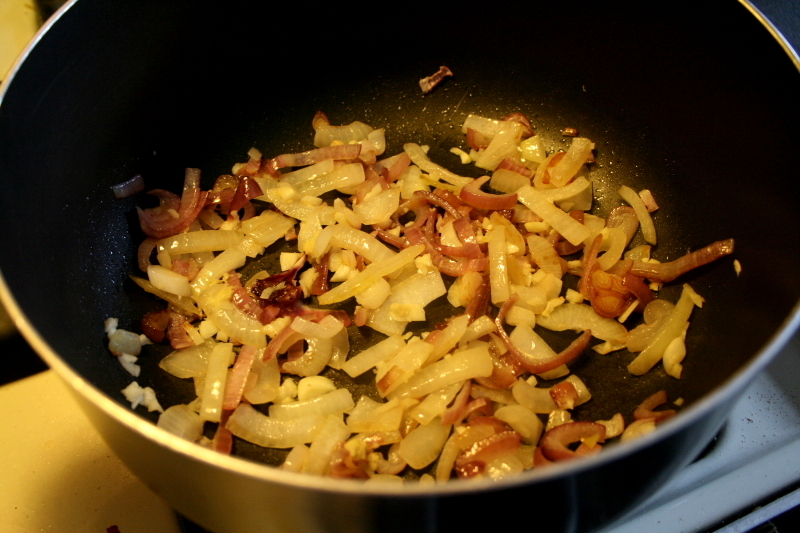 Add sliced onions and cook for about 10 minutes until softened, stirring occasionally. Add minced garlic and ginger and cook for an additional 3 – 4 minutes. Turn off heat. Add the noodles on top off the cooked onions, garlic and ginger, along with the veggies, scallions, and peanut sauce. Pour your 4 cups of chicken or veggies stock on top. Cover with a lid and turn heat up to high. Once it’s boiling, return to a simmer and cover loosely with lid so some steam can escape. Cook for 10 – 12 minutes, or until most of liquid has evaporated, stirring every 2 minutes. If including shrimp, add halfway through cook time. Dish is done once pasta is cooked and a small amount of liquid remains at the bottom (it’s good to keep some liquid – it makes for a nice gravy over the pasta). Serve with extra scallions, cilantro, and chopped peanuts and enjoy! Begin by sauteing your onions, garlic, and ginger. 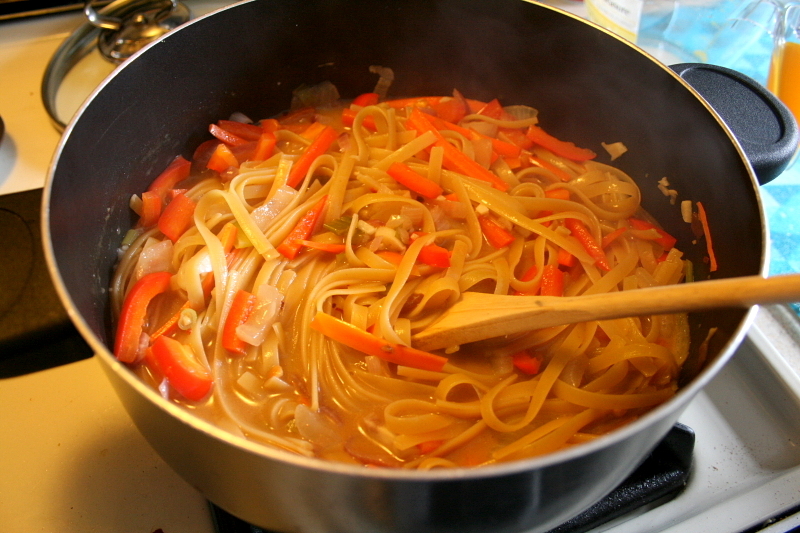 Place noodles on top of cooked onions, along with veggies, scallions, and peanut sauce. Cover with the 4 cups of stock or water and bring to a boil, covered. Once boiling, return to a simmer and cover loosely with a lid. 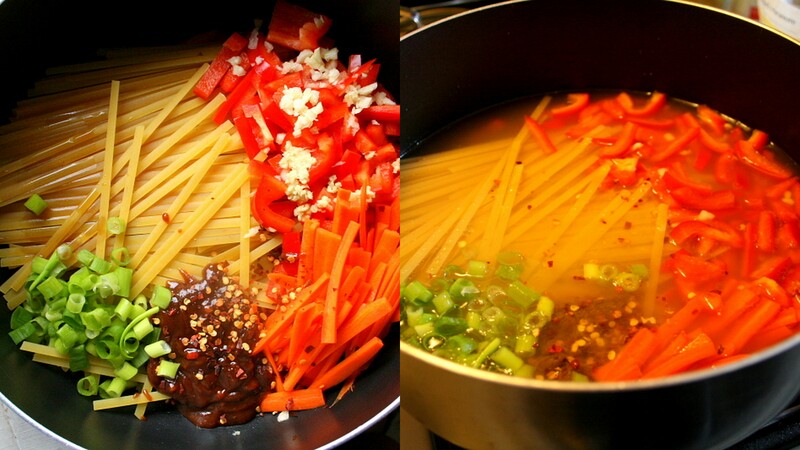 Cook for 10 – 12 minutes, stirring every 2 minutes, until pasta is cooked and most of liquid has evaporated. If using shrimp, add halfway through cook time. 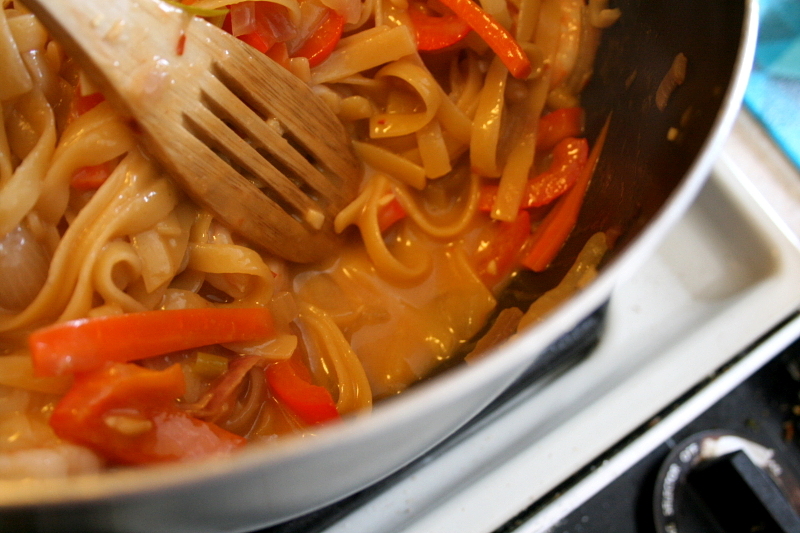 It’s okay to leave a little liquid at the bottom – it’s tasty and makes for a nice sauce over the noodles. Add the chopped scallions, cilantro, and peanuts and enjoy! So, so happy you liked this amazing dish – and thanks for the link! Thanks for this. I used left over roast chicken thighs and added a bit of tomato ketchup to the sauce. It gave the finished product the red colour you get when you order in a Thai restaurant. Very tasty and I definitely will make it again! That sounds delicious! Adding ketchup was a great idea and I bet the roasted chicken thighs gave it a really nice flavor. Glad you enjoyed it! You could use tahini (ground sesame seeds) or almond butter? For the sauce, just stick with soy rather than fish sauce and you’ll be good to go. 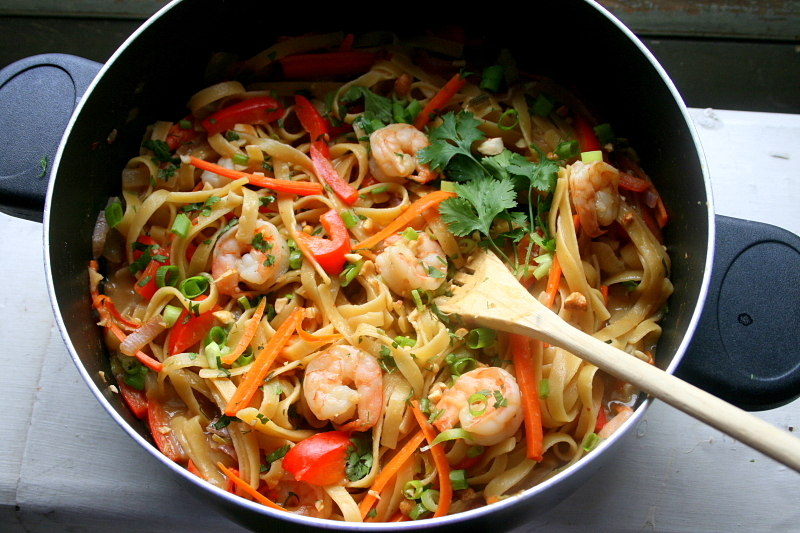 Could you use rice noodles for this dish if you added them to the sauce a bit later? I think rice noodles would work if you add them later, though you may also need to adjust the amount of liquid in the pot. I’m not sure by how much but I would go for less liquid as the noodles won’t be cooking as long. I work in hospital administration by day, and become a mad scientist in my kitchen by nighttime. The focus of this blog is fresh and healthy cooking, though sometimes you'll find some sweet treats or rich dishes. Enjoy!